African Grey Parrot Species Defined : P.e. erithacus – the nominate race. The terms “Congo”, “Ghana” and “Cameroon” all refer to supposed slight color and temperament variations of this subspecies. 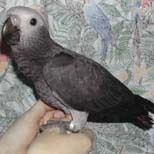 This is the subspecies most often pictured in books and articles about African Greys. The bird is about pigeon sized with a bright red tail, a solid black beak, and a light gray feathered body. Most every written or unwritten source (Bird Talk, American Cage Bird, breeder ads in these magazines, “The Guide to the Well Behaved Parrot” (a.k.a. the r.p.b. bible), the r.p.b. newsgroup, every exhibitor at every bird show we’ve attended and every pet store we’ve visited) refer to this subspecies as a “Congo” or a African Grey Congo. In rec.pets.birds the acronym CAG is used to refer to Congo African Grey. This is the “other grey”. 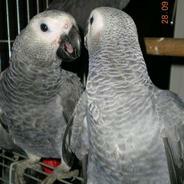 Commonly called Timnehs or African Grey Timnehs. These birds are on the whole smaller than the nominate race. The body feathers are dark gray. The tail is a duller maroon or red brown color. The upper mandible of the beak is all or partially bone colored. We have seen imported Congos are smaller than either of our Timnehs. We have also seen some Congos with body feathers that are as dark gray as our darker Timneh with less than bright tail feathers. However the beak color always has been the easiest most consistent differentiation. In rec.pets.birds the acronym TAG is used to refer to Timneh African Grey. Several mutations occur naturally in the wild, like the F2 Pied Mutation, which results in a broad red band across the abdomen. 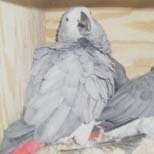 1998 saw the first created Grey mutation when South African bird breeder Von van Antwerpen and New Zealand partner Jaco Bosman selected F2 Pies and created the first red African Grey. Some articles we’ve read have suggested that this subspecies is extinct or has interbreed with the nominate race so much that any visible difference has vanished. This subspecies is (or was ?) limited yo two islands in the Gulf of Guinea (Principe and Fernando Poo). Forshaw in his “Parrots of the World” states that “this subspecies is probably not distinct from erithacus”. The bottomline is you probably won’t find one offered for sale by a breeder, pet store or bird show and you wouldn’t recognize one as anything but the nominate subspecies if you did see one. We can’t remember a posting in rec.pets.birds that discuss this subspecies. Okay, now we’ve laid out the scientific classification stuff, but what do you, the perspective pet owner need to understand? Just this, from a practical standpoint you have two subspecies of African Grey Parrots to choose from as your pet. These two subspecies are currently referred to “Congos” and “Timnehs” by 99% of those dealing with these birds. One last note about naming and this is mostly our opinion and comment. If you were to read Bird Talk issues of five years ago you’d find that it wasn’t as simple as “Congo” equals nominate and “Timneh” is the Timneh subspecies. The “Ghana” and “Cameroon” terms were attempts by those breeding and in the pet trade to differentiate their “wares” from those of their competitors. The results was confusion. Now that things seem pretty straight forward a few members of the “African Parrot Society” seem to want to stir the pot again. They have suggested that the common name for the nominate subspecies become “African Grey Parrot” while the name for the Timneh subspecies become “Timneh Parrot”. This sort seems like a deja vu since those suggesting striping “African Grey” from the name of the Timneh subspecies breed the nominate race for profit and would likely gain financially if people thought of their “product” as the only true “African Grey”. They claim this proposed change is to avoid confusion, however we’ve never met anyone confused by the “Congo” = nominate and “Timneh” = Timneh subspecies terminology.